First grease your ramekins with butter. To make the first layer, crush your hobnobs up either in a food processor or in a large bowl using the end of a rolling pin. Then add the melted butter (40 seconds in a microwave) and vanilla essence. When the mixture is completely blended together, add 2 heaped tablespoons into the bottom of the ramekins (again depending on the size, it should fill 1/3 of the container). Chill for 10 minutes. 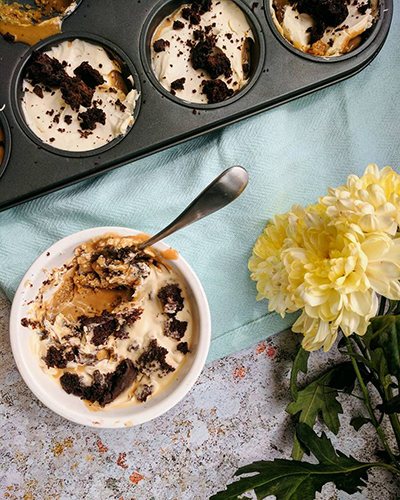 Once chilled get your jar of Joe & Seph’s Salted Caramel and add another layer to your ramekins…be as generous as you like! Then chill for 1 hour. Once chilled, top each one with a few banana slices. In a separate mixing bowl, using a whisk, add the double cream and beat until stiff peaks are formed. Top the rest of the ramekins with the cream. Take your flake and crumble it up then sprinkle evenly over the cream of each ramekin. Last but not least, dig in!